Home EDUCATION NEWS Thika teachers throw their weight behind President Uhuru Kenyatta. Thika teachers throw their weight behind President Uhuru Kenyatta. 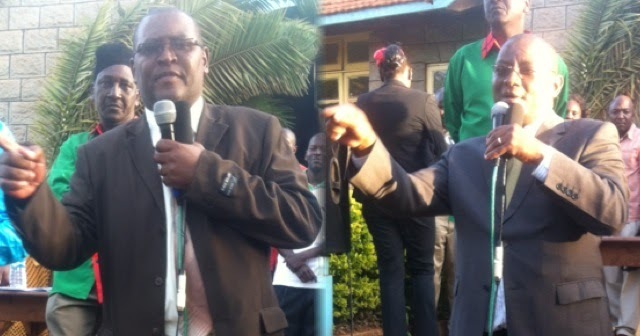 KNUT Thika Branch Chairman John Kuria (left) and the Executive Secretary Joe Mungai who led a full BEC meeting that unanimously endorsed the reelection of President Uhuru Kenyatta and his deputy William Ruto. The Kenya National Union of Teachers (KNUT) Thika Branch has unanimously thrown its support behind the reelection of President Uhuru Kenyatta and his deputy William Ruto ahead of the August 8 general election. Led by their chairman John Kuria and the Executive Secretary Joe Mungai during a full Branch Executive Committee (BEC) meeting in Thika, the teachers distanced themselves from the stand taken by KNUT Secretary General Wilson Sossion which they said was personal and unrepresentative of the position of the Kenyan teacher. The teachers said President Uhuru had demonstrated his commitment to lift the lives of Kenyans by investing billions of shillings in development projects. “The Jubilee administration has delivered on most of its promises to Kenyans including free primary and secondary education, teachers’ remuneration, improvement of healthcare, expansion of infrastructure network, increasing access to electricity and improvement of the country’s security among other achievements. That is why as the teachers of this nation, we are fully throwing our weight behind the reelection of President Uhuru and his deputy,” said Kuria. Kuria acknowledged the fact that whatever the president and his deputy had achieved all this development in the short span of four years thus their reason to opt to walk with the government on the path of development, unity and progress. The chairman added that the Jubilee’s plan to offer paid internships graduates from Universities and technical training institutes would help them gain experience and expertise required for the job market. On his part, Joe Mungai promised to mobilise teachers in Thika, Gatanga, Juja and Ruiru who fall under their jurisdiction to rally behind the president and his deputy. He added that teachers were willing to volunteer as the president agents during the polls to ensure that he sailed through victoriously. However, Mungai pointed out that their support was exclusively for the president and his deputy and they would leave teachers to make independent decisions on whom they would support in the other seats. “Let me make this clear that our support is exclusive for the president and his deputy. Teachers are at liberty to make their own independent decisions as to who they want to lead them in the grassroots. Otherwise, we appeal to our members to exercise maturity and express their political stand responsibly as they have always done before,” said Mungai. Present at the meeting was the branch treasurer Julius Chege, the gender representative and all members of the BEC.